The putative counterparts of human plasmacytoid pre-dendritic cells (pDCs) have been described in vivo in mouse models and very recently in an in vitro culture system. In this study, we report that large numbers of bone marrow-derived murine CD11c+B220+ pDCs can be generated with Flt3 ligand (FL) as the sole exogenous differentiation/growth factor and that pDC generation is regulated in vivo by FL because FL-deficient mice showed a major reduction in splenic pDC numbers. We extensively analyzed bone marrow-derived CD11c+B220+ pDCs and described their immature APC phenotype based on MHC class II, activation markers, and chemokine receptor level of expression. CD11c+B220+ pDCs showed a nonoverlapping Toll-like receptor pattern of expression distinct from that of classical CD11c+B220− dendritic cells and were poor T cell stimulators. Stimulation of CD11c+B220+ pDCs with oligodeoxynucleotides containing certain CpG motifs plus CD40 ligand plus GM-CSF led to increased MHC class II, CD80, CD86, and CD8α expression levels, to a switch in chemokine receptor expression that affected their migration, to IFN-α and IL-12 secretion, and to the acquisition of priming capacities for both CD4+ and CD8+ OVA-specific TCR-transgenic naive T cells. Thus, the in vitro generation of murine pDCs may serve as a useful tool to further investigate pDC biology as well as the potential role of these cells in viral immunity and other settings. Dendritic cells (DC)2 represent a heterogeneous group of bone marrow (BM)-derived hematopoietic cells that have the capacity to present Ags to and to activate naive T cells (reviewed in Refs. 1 and 2). They play important roles in the induction of central and peripheral tolerance and in the regulation of different types of T cell immune responses, and may also function as effector cells in innate immunity. In humans, two main DC subsets have been characterized: CD14−CD11c+ DCs and lineage-negative CD11c−IL3Rα+ DCs. These latter cells, also called plasmacytoid pre-DCs (pDCs), natural IFN-producing cells, or DC2s, are capable of differentiating into DCs when cultured in IL-3 and CD40 ligand (CD40L)-containing medium. They gain T cell stimulatory capacity (Ref. 3 and reviewed in Ref. 4) but do not produce large amounts of IL-12 when cultured in the presence of IL-3 and CD40L. Depending upon microenvironment, culture conditions, or T cell/APC ratios (5), human pDCs can induce Th1- and/or Th2-type responses or the generation of IL-10-producing CD8+ T suppressor cells (Refs. 6, 7, 8, 9 and reviewed in Ref. 10). A predominant feature of pDCs when stimulated with viruses (9) or with oligodeoxynucleotides containing certain CpG motifs (CpG) (Ref. 11 and reviewed in Ref. 12) appears to be their capacity to secrete large amounts of IFN-α, which can synergize with other proinflammatory cytokines to activate innate and adaptive immune effector cells (13, 14, 15). Human circulating pDCs express L-selectin (CD62L) and multiple chemokine receptors, including CXCR3, CXCR4, and CCR7, and are thought to enter inflamed lymph nodes (LN) directly from the blood upon stimulation, via high endothelial venules (9, 16). The identification of murine IFN-α-producing DCs has recently been reported by different groups (17, 18, 19, 20, 21). These cells are found in the spleen, BM, and LN of naive animals, and their number can be increased by the in vivo administration of Flt3 ligand (FL) or FL and GM-CSF (19). Murine pDCs have been reported as Ly6C+B220+CD11cintCD11b− cells expressing lower levels of costimulatory molecules and MHC class II than those of “classical” DCs. Expression of CD8α, CD80 and CD86, and MHC class II is increased after activation with viruses, CpG, or IFN-α. Stimulation also induces T cell stimulatory capacity. Our laboratory has previously described an FL-dependent, in vitro culture system allowing the generation of two murine DC subsets (CD11c+CD11b+ and CD11c+CD11bint) from BM precursors (22). The present study extends these findings by further defining a third subset of BM-derived DCs showing similar phenotypic characteristics as in vitro (23) and in vivo murine pDCs (17, 18, 19, 20, 21). In addition, in this study, we report for the first time changes occurring upon stimulation in the chemotactic migration of these cells toward different chemokines and show their T cell-priming capacities for both naive CD4+ and CD8+ T cells. Finally, we emphasize the in vivo role of FL for the generation and/or differentiation of murine pDCs by reporting their strong reduction in FL-deficient (FL-KO) mice. Female C57BL/6 (B6) and BALB/c mice (8–12 wk of age) were obtained from Taconic Farms (Germantown, NY). FL-KO mice, maintained on a C57BL/6 background, were described previously (24) and bred at Amgen (Seattle, WA). OT-II TCR-transgenic (-Tg) mice specific for chicken OVA peptide 323–339 (OT-IIp) in the context of I-Ab (25) and OT-I TCR-Tg mice specific for chicken OVA peptide 357–364 (OT-Ip) in the context of H-2Kb (26) were bred at Amgen. All mice were housed under specific pathogen-free conditions and according to federal guidelines. BM cells were isolated by flushing femurs with PBS supplemented with 2% heat-inactivated FBS (Life Technologies, Grand Island, NY). The BM cells were resuspended in Tris-ammonium chloride at room temperature for 1 min to lyse RBC. The cells were then resuspended in culture medium consisting of McCoy’s medium supplemented with essential and nonessential amino acids, 1 mmol/L sodium pyruvate, 2.5 mmol/L HEPES buffer (pH 7.4), vitamins, 5.5 × 10−5 mol/L 2-ME, 100 U/ml penicillin, 100 μg/ml streptomycin, 0.3 mg/ml l-glutamine (PSG), and 10% FBS (all medium reagents from Life Technologies). BM cells were cultured as previously described (22) for the time indicated in the figures at 1 × 106 cells/ml, in tissue culture flasks (Falcon; BD Biosciences, Mountain View, CA) or in 24-well plates (Costar Corning, Cambridge, MA) in culture medium supplemented with 200 ng/ml recombinant human FL (Chinese hamster ovary cell-derived), 20 ng/ml murine IL-3, and/or 20 ng/ml murine GM-CSF (all from Amgen). Cultures were incubated at 37°C in a humidified atmosphere containing 10% CO2. Cells were harvested at different times from the cultures by vigorous pipetting and removal of nonadherent cells. To recover adherent cells, Versene 1:5000 (Life Technologies) was added after two washes and cells were incubated for 10 min at 37°C. The cells were then pooled with the nonadherent fraction. In vitro activation of the DCs from FL-supplemented cultures was accomplished by the addition of different stimulation mixtures including 2 μg/ml phosphorothioate-modified oligodeoxynucleotides containing CpG motifs 1826 (TCCATGACGTTCCTGACGTT) (Sigma-Genosys, The Woodlands, TX), 5 μg/ml CD40L trimer (Amgen), 20 ng/ml recombinant murine GM-CSF, 20 μg/ml Staphylococcus aureus Cowan I bacteria (SAC; Pansorbin; Calbiochem-Novabiochem, San Diego, CA), 10 μg/ml Poly I:C (Sigma-Aldrich, St. Louis, MO), 100 ng/ml LPS (Sigma-Aldrich), 20 ng/ml IFN-γ (BD PharMingen, San Diego, CA), or HSV-1 (strain F, multiplicity of infection of 10; ATCC VR-33; American Type Culture Collection, Manassas, VA) for 16–24 h unless otherwise noted in figures. Splenic DCs were purified following a previously described protocol (27). Briefly, spleens were digested with 200 U/ml collagenase (Life Technologies) in HBSS with Ca2+ and Mg2+ for 30 min at 37°C. The spleens were then mashed and further dissociated in Ca2+-free medium in the presence of 10 mmol/L EDTA. The cells were then resuspended in Tris-ammonium chloride at room temperature for 1 min to lyse RBC, resuspended in FACS buffer (see Flow cytometry below), and counted. Before incubation with mAbs, the cells were blocked at 4°C for 20 min in FACS buffer (PBS containing 2% FBS, 2% normal rat serum, 2% normal hamster serum, 2% normal mouse serum, 10 μg/ml CD16/CD32 (2.4G2) anti-FcR mAb (BD PharMingen), and 0.02% sodium azide (Sigma-Aldrich)). All mAbs were purchased from BD PharMingen except where noted. In addition to isotypes controls, the following mAbs (clone name given in parentheses) were used: CD3ε (145-2C11), CD4 (GK1.5), CD8α (53-6.7), CD11b (M1/70), CD11c (HL3), CD19 (1D3), CD40 (HM40-3), CD45R/B220 (RA3-6B2), CD62L (MEL-14), CD80 (16-10A1), CD86 (GL-1), CD123 (IL3Ra) (5B11), H-2Kb (AF6-88.5), IAb (AF6-120.1), Gr-1 (RB6-8C5), Ly6c (AL-21), and Pan-NK (DX5). PE-conjugated F4/80 (CI:A3-1) was purchased from Caltag (Burlingame, CA). Biotinylated DEC-205 (NLDC145; Accurate Chemical and Scientific, Westbury, NY) binding was detected with streptavidin-PE (BD PharMingen). Propidium iodide (BD PharMingen) at 2 μg/ml was added in the last wash to exclude dead cells from analysis. Flow cytometric analyses were performed on a FACSCalibur with CellQuest software (both BD Biosciences). Cells were sorted by flow cytometry using either a FACSVantage cell sorter (BD Biosciences) or a MoFlo cell sorter (Cytomation, Fort Collins, CO). Cells were stained in FACS buffer (without azide) with anti-CD11c-PE, -B220-APC, and -CD11b-FITC mAbs and sorted into CD11c+CD11b+B220− and CD11c+CD11b−B220+ populations (purity >95%). Harvested cells were centrifuged at room temperature onto slides at 30,000–40,000 cells/slide, at 500 rpm for 5 min. Slides were air-dried and stained with Diff-Quik (Dade Behring, Newark, NJ) for morphological analysis. Phase-contrast observations of cultures were made by means of an inverted microscope (Leica, Bannockburn, IL) at ×400 magnification. Purified CD11c+CD11b+B220− and CD11c+CD11b−B220+ cells were resuspended in RPMI 1640 without Phenol Red and 10% FBS added. Calcein-AM dye (Molecular Probes, Eugene, OR) was added to a final concentration of 5 μg/ml. Cells were then incubated at 37°C for 30–40 min. Unincorporated calcein dye was washed out three times by centrifugation in PBS plus 0.1% BSA. Recombinant mouse macrophage-inflammatory protein (MIP)-1α/CC chemokine ligand (CCL)3, MIP-1β/CCL4, RANTES/CCL5, MIP-3β/CCL19, and secondary lymphoid-tissue chemokine/CCL21 (all R&D Systems, Minneapolis, MN) were diluted in PBS 0.1% BSA at a final concentration of 100 ng/ml and were added according to manufacturer’s instructions to the bottom wells (30 μl) of Neuroprobe ChemoTX 96-well plates #101-3 (NeuroProbe, Gaithersburg, MD). Pore size was 3 μm, and well diameter was 3.2 mm. Labeled cells were resuspended in RPMI 1640 10% FBS and added (2 × 104 cells in 25 μl) to the top filter sites of the ChemoTX system. The plates were then incubated at 37° and 5% CO2 for 60 min. After incubation, the cell droplets on the top of the plate were washed off thoroughly with PBS/0.1% BSA four to five times. Excess liquid was removed from the top of the filter. The plates were read on a Molecular Devices (Sunnyvale, CA) Gemini Spectramax XS reader at excitation 490 nm/emission 528 nm, with a cutoff of 515 nm. Values were expressed as mean fluorescent count fold increase by calculating as follows: experimental fluorescent counts/spontaneous fluorescent counts. DCs from C57BL/6 mice were generated, sorted, and activated in vitro overnight as described above. DCs were incubated overnight with 0.5 mg/ml OVA-protein (Albumin, Chicken Egg, 5X Crystalline; Calbiochem-Novabiochem). Naive CD8+ or CD4+ T cells were enriched from spleen and peripheral LNs of OVA-specific TCR-Tg OT-I or OT-II mice, respectively, by immunomagnetic cell separation using negative selection with the StemSep Enrichment mixture kits for CD8+ or CD4+ T cells (StemCell Technologies, Vancouver, British Columbia, Canada). The percentage of enriched T cells expressing Tg TCR was determined by flow cytometry (>90%), using anti-CD4-PE or anti-CD8-PE and anti-Vα2-FITC mAb (BD PharMingen). For proliferation and cytokine production assays, naive T cells at 5 × 104 cells/well were seeded into 96-U-well plates (Costar Corning, Cambridge) and cultured with varying numbers of protein-pulsed BM-derived DCs in 200 μl of IMDM (Life Technologies) plus additives per well. Cultures were maintained for 72 h at 37°C. The proliferation was assayed by pulsing the cells with 0.5 μCi of [3H]thymidine overnight and harvesting them the next day. At 72 h, culture supernatants were collected and tested in triplicate for IFN-γ by ELISA (BD PharMingen) or for IL-2, IL-4, IL-10, IFN-γ, and TNF-α by Luminex using the Beadlyte Mouse MultiCytokine Standard 1 kit (Upstate, Charlottesville, VA), according to manufacturer’s instructions. For cytotoxic assays, naive OT-I CD8+ T cells were stimulated in vitro as described above with varying numbers of protein-pulsed BM-derived DCs. After 72 h, 1 × 104 syngeneic (H-2b) C1498 target cells, which were pulsed for 1 h at 37°C with or without 1 μM OT-Ip in the presence of radioactive chromium (51Cr) in IMDM, were added in a total volume of 200 μl to the OT-I culture. After 4 h of incubation at 37°C, 25 μl of supernatant was removed and added to Lumaplate-96 plates (Packard Instrument, Meriden, CT), and radioactivity was counted on a Topcount counter (Packard Instrument). Spontaneous and total release were determined by adding culture medium or detergent, respectively, to target cells. The percentage of specific 51Cr release was calculated as follows: (experimental release − spontaneous release)/(total release − spontaneous release) × 100. DCs from naive mice were generated, sorted, and activated in vitro overnight as described above. Supernatants were then collected and assayed by ELISA for murine IL-10 and IL-12p70 (BD PharMingen) and IFN-α (PBL Biomedical Laboratories, New Brunswick, NJ) according to the manufacturer’s instructions. The limits of detection for IL-10, IL-12p70, and IFN-α were 10, 40, and 20 pg/ml, respectively. In vitro-derived DCs were sorted by flow cytometry. Total RNA was purified with QIAshredder and Rneasy Mini spin column kits (Qiagen, Valencia, CA) and treated with DNase (Ambion, Austin, TX) as recommended by the manufacturers. Single-stranded cDNA synthesis was conducted on total RNA using TaqMan reverse transcription kits (Applied Biosystems, Foster City, CA) with random hexamer primers. Mouse gene-specific primers and probe sets for TaqMan PCR were designed using Primer Express software (Applied Biosystems) with additional manual adjustments to minimize oligonucleotide hairpin loops, homo- or hetero-dimerization, and amplicon size. Test gene primer and FAM-labeled probe sets were optimized for concentration, amplification efficiency, and faithful coamplification with one or more housekeeper gene primer and VIC-labeled probe sets—the latter including β-actin, GAPDH, hypoxanthine phosphoribosyltransferase, and porphobilinogen deaminase. Real-time quantitative PCR were set up in 96-well plates using the above reagents and TaqMan master mix, as recommended by the manufacturer and as indicated by the optimization data, and were run on 7700 ABI thermal cyclers (Applied Biosystems). Real-time data were acquired and analyzed using Sequence Detection System software (Applied Biosystems) with manual adjustment of baseline and threshold parameters. Relative expression levels were determined using cycle threshold values and the 2−ΔΔCt method to adjust for coamplified housekeeper gene levels, 2-fold amplification/cycle rates, and the reference expression level of control samples (28). The sequences for primers and probe sets were as follows: muTLR2up, GCC ACC ATT TCC ACG GAC T; muTLR2tqf, CAC GCC CAC ATC ATT CTC AGG TAC CA; muTLR2low, GCT TCC TCT TGG CCT GGA G; muTLR3up, CCC AGC TCG ATC TTT CCT ACA; muTLR3tqf, ACA ACC TCC ATG ATG TCG GCA ACG; muTLR3low, GCT TGG GAG ATA GGA GAA GGA A; muTLR4up, ACT GGG TGA GAA ATG AGC TGG T; muTLR4tqf, AAT TTA GAA GAA GGA GTG CCC CGC TTT CAC; muTLR4low, GAA TAA AGT CTC TGT AGT GAA GGC AGA; muTLR7up, CCA AAA ATG GGC TCA AAT CTT; muTLR7tqf, TCT TTT GGG ACA GAC TCC AGT TAC TGA AGC AT; muTLR7low, GCT GAG GTC CAA AAT TTC CAA; muTLR9up, GTA CTT GAT GTG GGT GGG AAT TG; muTLR9tqf, TGC GAC CAT GCC CCC AAT CCC; muTLR9low, AGG GAC TTT TGG CCA CAT TCT AT; muCCR5up, CCA TGC AGG CAA CAG AGA CT; muCCR5tqf, CTT GGA ATG ACA CAC TGC TGC CTA AAC C; muCCR5low, TCC AAC AAA GGC ATA GAT GAC AG; muCCR7up, TG CTG CGT CAA CCC TTT CT; muCCR7tqf, ATG CCT TCA TCG GCG TCA AGT TCC; and muCCR7low, AGT CCT TGA AGA GCT TGA AGA GGT. Our laboratory recently reported that multiple subsets of murine DCs can be generated from FL-supplemented BM culture (22). We examined these cultures for the possible generation of CD11c+B220+ pDCs. BM cells from naive mice were prepared and cultured at high density (1 × 106 cells/ml) in the presence or absence of FL, GM-CSF, and IL-3. Cells were analyzed periodically over a 15-day period to determine their expansion and phenotype by flow cytometry. Fig. 1⇓A shows the appearance over time of BM-derived CD11c+ cells expressing or not expressing B220 under different conditions. Our data show that addition of FL only was sufficient for the in vitro generation of CD11c+B220+ cells from BM precursors, confirming recently published data from another group (23) using a similar in vitro culture system. In vitro generation of BM-derived CD11c+B220+ DCs. BM cells were cultured for different times in culture medium alone or supplemented with human FL, murine GM-CSF, or murine IL-3. A, Kinetic analysis of the in vitro generation of CD11c+B220− and CD11c+B220+ DCs in total cell numbers under the different culture conditions is shown. Results are expressed as mean ± SD of duplicate wells. B, CD11c-FITC vs B220-APC FACS profiles at different time points in the FL culture are shown. Numbers represent the percentage of cells in each region. C, Comparative FACS analysis after 9 days in culture of the generation of CD11c+B220+ DCs among FL-, GM-CSF-, and FL plus GM-CSF-containing medium is shown. An electronic gate was determined on CD11c+ cells, and CD11b vs B220 expression was analyzed. Results shown are representative of four experiments. Indeed, as observed in Fig. 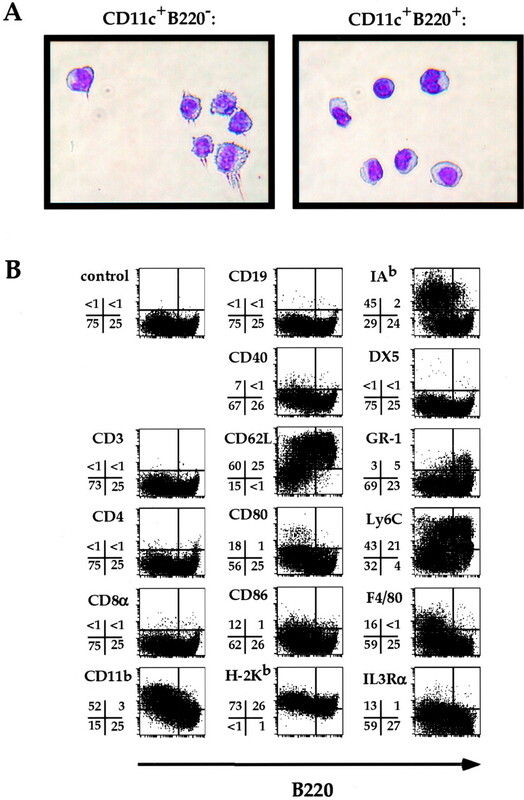 1⇑B, freshly isolated BM cells analyzed ex vivo contained <2% of CD11c+B220+ cells. Culture in FL-containing medium induced the generation of CD11c+B220+ and CD11c+B220− DC subsets. After 9 days of culture, at the peak of the culture, 15–20% of the cells were CD11c+CD11b−B220+ (Fig. 1⇑, B and C) whereas the remaining CD11c+B220− population could be subdivided into CD11bhigh and CD11bint as previously reported (22). Between days 9 and 15, total CD11c+CD11b+B220− and CD11c+CD11b−B220+ numbers dropped rapidly. On a percentage basis, CD11c+CD11b−B220+ cells disappeared more rapidly than CD11c+CD11b+B220− cells, arguing in favor of a possible shorter survival in culture for CD11c+CD11b−B220+ cells. 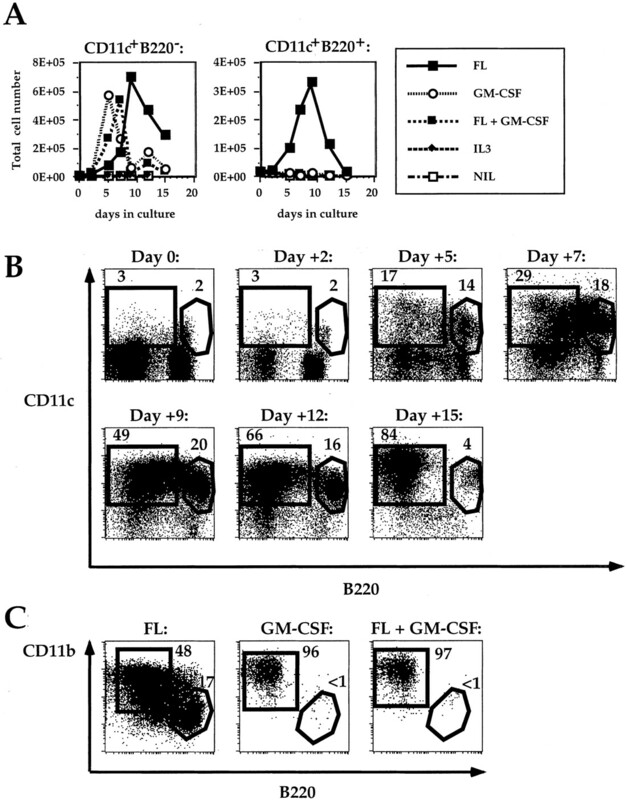 When BM-cells were cultured in the presence of GM-CSF alone, “classical” CD11c+B220− but not CD11c+B220+ DCs were rapidly generated (Fig. 1⇑, A and C). The total CD11c+B220− cell number dropped after 5 days due to overgrowth in the culture. GM-CSF antagonized the effect of FL on pDC generation when both cytokines were mixed in the same culture medium (Fig. 1⇑, A and C). Blocking GM-CSF by adding a neutralizing dose of anti-murine GM-CSF in the FL-containing culture did not modify the generation of either CD11c+B220− or CD11c+B220+ cells (data not shown). Finally, IL-3 had no effect on the generation of CD11c+B220− and CD11c+B220+ DCs (Fig. 1⇑A). Because FL was shown to be a potent inducer of CD11c+B220+ cells in vitro, we examined its role in vivo. Total spleen cells from FL-KO (24) and wild-type mice were stained with anti-CD11c, -B220 and -CD19 mAbs and the percentages (Fig. 2⇓A) and total numbers (Fig. 2⇓B) of CD11c+B220− and CD11c+B220+ were determined by electronically gating on CD19− cells to exclude B cells. A dramatic reduction in the percentages and numbers of both splenic CD11c+B220− and CD11c+B220+ DCs was observed in FL-KO mice compared with those of wild-type animals with a four- and seven-time reduction in numbers, respectively. FL is necessary for the in vivo generation of CD11c+B220+ DCs. A, Multicolor fluorocytometric analysis of splenic DCs from wild-type and FL-KO mice. Total spleen cells were stained with anti-CD11c-FITC, -B220-APC, and -CD19-PE mAbs. An electronic gate was performed on CD19− cells to exclude B cells, and CD11c vs B220 expression was analyzed. Numbers indicate the percentage of cells for each region among CD19− cells. B, Shown is a comparative analysis of CD11c+B220− (□) and CD11c+B220+ (▪) total cell numbers in spleen cells from wild-type control and FL-KO mice. The data represent the mean ± SD of three individual mice and are representative of three similar experiments. Morphologic differences distinguish CD11c+B220+ from CD11c+B220− DCs. Fig. 3⇓A shows cytospin cover glasses of both BM-derived DC types. Whereas CD11c+B220− DCs showed the classical stellate DC morphology, CD11c+B220+ cells appeared rounder and had a smooth surface with few dendrites and diffuse nuclei, an appearance similar to that of freshly isolated murine and human pDCs (3, 20, 21). Morphologic and phenotypic analysis of BM-derived CD11c+ DCs after 9 days in culture. 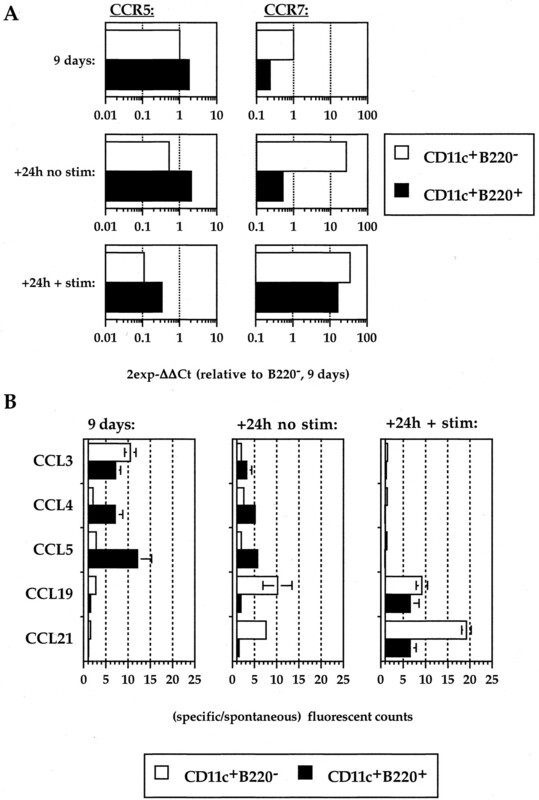 A, Morphologic comparison between CD11c+B220− and CD11c+B220+ BM-derived DCs is shown. Cells were harvested and sorted after 9 days in culture in FL-containing medium, and cytospins were prepared. B, Phenotypic analysis by multicolor fluorocytometry is shown. Cells were stained with anti-CD11c-FITC and -B220-APC mAbs and with a panel of different FITC-conjugated mAbs. Electronic gates were performed on CD11c+ cells, and B220 expression was analyzed against each third marker. Isotype controls were tested (control) and dead cells were excluded by propidium iodide labeling. Numbers in quadrants represent the percentage of cells for each quadrant. Analyses were performed a minimum of three times for each marker. To better define the phenotype of in vitro BM-derived CD11c+B220+, we performed multicolor cytometric analyses after 9 days of culture. Fig. 3⇑B shows that CD11c+B220+ cells did not express T, B, and NK cell markers (e.g., CD3ε, CD4, CD8α, CD19, and DX5) and showed an immature APC phenotype based upon little to no expression on most CD11c+B220+ DCs of MHC class II (IAb) and costimulatory molecules CD40, CD80, and CD86. CD11c+B220+ cells were positively stained for MHC class I (H-2Kb), CD62L, and Ly6C, whereas CD11b and F4/80 were not expressed. GR-1 (also called Ly6G), which was previously used to characterize murine pDCs (19, 20, 21), was expressed by a fraction of CD11c+B220+ cells. Interestingly, IL-3Rα (CD123) could not be detected on the surface of murine BM-derived CD11c+B220+ cells whereas it was shown to be expressed by human pDCs (3). TLR are pattern-recognition receptors implicated in the recognition of pathogen structures and may link innate and adaptive immunity (reviewed in Ref. 12). CD11c+B220− and CD11c+B220+ DCs were sorted by flow cytometry after 9 days of culture in FL-containing medium, total RNA was extracted, treated with DNase, and single-stranded cDNA synthesis was conducted. The expression of TLR2, TLR3, TLR4, TLR7, and TLR9 was measured by real-time TaqMan PCR. Nonoverlapping patterns of expression were observed for the different TLR tested (Fig. 4⇓A). “Classical” CD11c+B220− BM-derived DCs preferentially expressed TRL2, TLR3, and TLR4, whereas the expression of TLR7 and TLR9 was stronger in CD11c+B220+ cells. BM-derived CD11c+B220+ DCs can be activated in vitro. In vitro activation of the DCs from FL-supplemented cultures was accomplished by the addition of different stimulation mixtures including CpG, CD40L trimer, recombinant murine GM-CSF, IL-3, SAC, Poly I:C, LPS, IFN-γ, or HSV-1 during the final 24 h of culture. A, TLR mRNA expression analysis by real-time TaqMan PCR on unactivated CD11c+B220− (□) and CD11c+B220+ (▪) DCs is shown. Data are relative to coamplified housekeeper gene levels and to CD11c+B220− value. B, IL-10, IL12 p70, and IFN-α production analysis by ELISA on supernatants from CD11c+B220+ and CD11c+B220− sorted cells with or without activation is shown. Results are presented as the mean ± SD of triplicate wells. C, Activation marker up-regulation was analyzed by fluorocytometry after in vitro activation with CpG plus CD40L plus GM-CSF. Level of expression for CD4, CD8α, MHC class II (IAb), CD80, CD86, and DEC-205 were compared between CD11c+B220+ and CD11c+B220− with (thick line) or without (thin line) in vitro activation with CpG plus CD40L plus GM-CSF. Dotted lines indicate isotype control stainings. Results shown are representative of three similar experiments. After 9 days of culture in FL-containing medium, total cells were recovered, purified according to CD11c and B220 vs CD11b expression by flow cytometry (CD11c+CD11b+B220− vs CD11c+CD11b−B220−, purity > 95%) and cultured with or without different stimulatory reagents for 24 h. Cell culture supernatants were harvested and tested for the production of IFN-α, IL-12p70, and IL-10 by ELISA (Fig. 4⇑B). CpG, SAC, and HSV-1 alone, as well as the CpG plus CD40L plus GM-CSF mixture, each induced secretion of high levels of IFN-α (>500 pg/ml/105 cells) by CD11c+B220+ DCs. “Classical” CD11c+B220− DCs, when activated with CpG plus CD40L plus GM-CSF produced ∼10-fold more IL-12p70 than did CD11c+B220+ DCs (∼3000 pg/ml/105 cells ± 420 vs ∼270 pg/ml/105 cells ± 62, respectively). Finally, CpG alone was the strongest IL-10 secretion inducer (>50 pg/ml) for both CD11c+B220− and CD11c+B220+ subsets. Cell phenotype after in vitro stimulation was assessed by flow cytometry. Of the 11 stimulatory conditions we tested, the CpG plus CD40L plus GM-CSF mixture was the strongest activator for pDCs, based upon CD4, CD8α, MHC class II (IAb), CD80, CD86, and DEC-205 levels of expression. Indeed, as shown in Fig. 4⇑C, a significant up-regulation of CD8α, CD80, CD86, and IAb molecules was observed among CD11c+B220+ cells whereas CD4 and DEC-205 were slightly up-regulated. In comparison, CD11c+B220− cells underwent a spontaneous maturation after reculture in vitro in the absence of activation. The levels of CD80, CD86, IAb, and DEC-205 were further up-regulated by CpG plus CD40L plus GM-CSF on these cells, whereas CD4 and CD8α expression were only slightly up-regulated. A key characteristic of DCs appears to be their capacity to migrate from the blood to peripheral tissues and, upon stimulation, to the draining LN where they can activate naive Ag-specific T cells. This migration is driven by different chemokines interacting with chemokine receptors that are differently expressed by DCs, relative to subset and maturation stage. Immature DCs were shown to express receptors such as CCR1, CCR2, CCR5, and CCR6, which are specific for inflammatory chemokines, whereas maturation down-regulates these receptors and up-regulates the expression of CCR7 (29, 30, 31). We compared CD11c+B220− and CD11c+B220+ DCs for CCR5 and CCR7 mRNA expression and for their attraction toward different chemokines in an in vitro chemotaxis assay. Three different DC maturation stages were analyzed. Immature DCs were harvested after the 9-day culture period, sorted by flow cytometry, and analyzed directly (9-day condition). After flow cytometry sorting, weak and full maturation were induced by cultivating CD11c+B220− and CD11c+B220+ DCs in FL-containing medium in the absence or presence of CpG plus CD40L plus GM-CSF (24 h, no stimulation, and 24 h, plus stimulation, respectively). 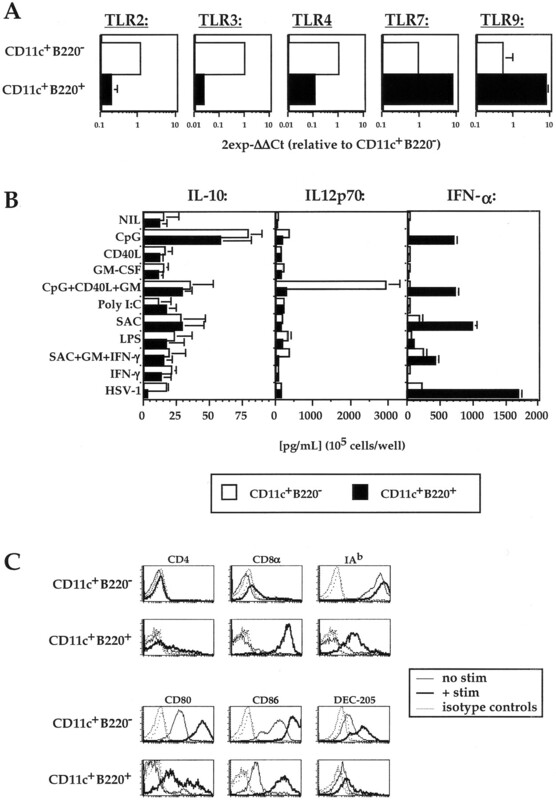 Freshly isolated immature CD11c+B220− and CD11c+B220+ DCs showed similar levels of CCR5 mRNA expression (Fig. 5⇓A), whereas CCR5 expression was slighty reduced after overnight culture with CpG plus CD40L plus GM-CSF. CCR7 mRNA expression was low in both immature subsets (9-day condition) but was dramatically augmented in CD11c+B220− DCs after reculture in vitro in the absence of stimulation. Activation with CpG plus CD40L plus GM-CSF increased CCR7 mRNA expression in CD11c+B220+ DCs. BM-derived DCs and migratory capacities. Immature DCs were harvested and sorted into CD11c+B220− and CD11c+B220+ either after the 9-day culture period (9-day condition) or after a subsequent 24-h culture in FL-containing medium in the absence or presence of CpG plus CD40L plus GM-CSF (plus 24 h, no stimulation, and plus 24 h, plus stimulation, respectively). A, CCR5 and CCR7 chemokine receptor mRNA expression analysis by real-time TaqMan PCR on CD11c+B220− (□) and CD11c+B220+ (▪) DCs is shown. Data are relative to coamplified housekeeper gene levels and to CD11c+B220− value. B, In vitro DC migration analysis in a chemotaxis assay toward CCL3, CCL4, CCL5, CCL19, and CCL21 chemokines is shown. Values are expressed as follows: experimental fluorescent counts/spontaneous fluorescent counts. Results are presented as the mean ± SD of triplicate wells, and the experiment was performed four times. Despite similar CCR5 mRNA expression between CD11c+B220− and CD11c+B220+ DCs, these two subsets displayed different migration patterns toward CCL3 (MIP-1α), CCL4 (MIP-1β), and CCL5 (RANTES), three putative CCR5 ligands (32). Immature CD11c+B220+ DCs were strongly mobilized by these three chemokines, whereas the CD11c+B220− fraction showed mobilization only toward CCL3 (Fig. 5⇑B). After overnight culture in the absence of stimulation, CCL3-, CCL4- and CCL5-driven migration was barely detectable with CD11c+B220− DCs, but still evident with CD11c+B220+ DCs. This condition was also sufficient to induce the migration of CD11c+B220− cells toward CCR7 ligands (CCL19 (MIP-3β) and CCL21 (6Ckine)) but insufficient for CD11c+B220+ DCs. However, overnight activation with CpG plus CD40L plus GM-CSF induced CCL19- and CCL21-mediated migration by the CD11c+B220+ subset and increased CCL21-mediated CD11c+B220− DC migration, accompanied by a lack in mobilization toward CCL3, CCL4, and CCL5. Another key characteristic of dendritic cells is their ability to prime naive T cells. We analyzed the in vitro T cell stimulatory capacity of both BM-derived CD11c+B220− and CD11c+B220+ DC subsets in two different syngeneic model systems involving either OVA-specific TCR-Tg CD4+ (OT-II) or OVA-specific TCR-Tg CD8+ (OT-I) naive T cells. Without any prior activation in vitro, OVA-protein-pulsed CD11c+B220+ pDCs were poor naive OT-II CD4+ T cell stimulators, in terms of proliferation and cytokine secretion, relative to CD11c+B220− DCs (Fig. 6⇓). However, in vitro activation with CpG plus CD40L plus GM-CSF increased the ability of BM-derived CD11c+B220+ cells to stimulate naive OT-II CD4+ T cells, although to lower levels than those obtained with the CD11c+B220− counterpart. The same effect was observed when the two DC subsets were pulsed with the immunodominant OVA-peptide (data not shown). CD4+ T cell stimulatory capacity of BM-derived CD11c+B220+ DCs. Sorted CD11c+B220− (□, ▪) and CD11c+B220+ (○, •) DCs from C57BL/6 mice were pulsed in vitro for 24 h with 0.5 mg/ml OVA (OVA-protein) and simultaneously activated (□, ○) or not (▪, •) with 2 μg/ml CpG, 5 μg/ml CD40L, and 20 ng/ml recombinant murine GM-CSF. DCs were then used as stimulator cells for syngeneic OVA-specific TCR-Tg (OT-II) CD4+ T cells. Proliferation (A) and cytokine secretion (B–F) were quantified by [3H]thymidine incorporation and Luminex, respectively. Results are presented as the mean ± SD of triplicate wells, and the experiment was performed three times. In addition to proliferation induction, the CD4+ T helper response was assayed by collecting supernatants after 72 h of culture to analyze IL-2, IL-4, IL-10, IFN-γ, and TNF-α secretion (Fig. 6⇑). As expected, unstimulated CD11c+B220+ DCs did not induce strong cytokine secretion by CD4+ T cells, reflecting the weak T cell stimulation observed at the level of proliferation. However, after pDC stimulation with CpG plus CD40L plus GM-CSF, a significant increase in cytokine secretion was observed. No clear Th1 or Th2 bias was induced, because both Th1-related (IFN-γ) and Th2-related (IL-4) cytokines were secreted. 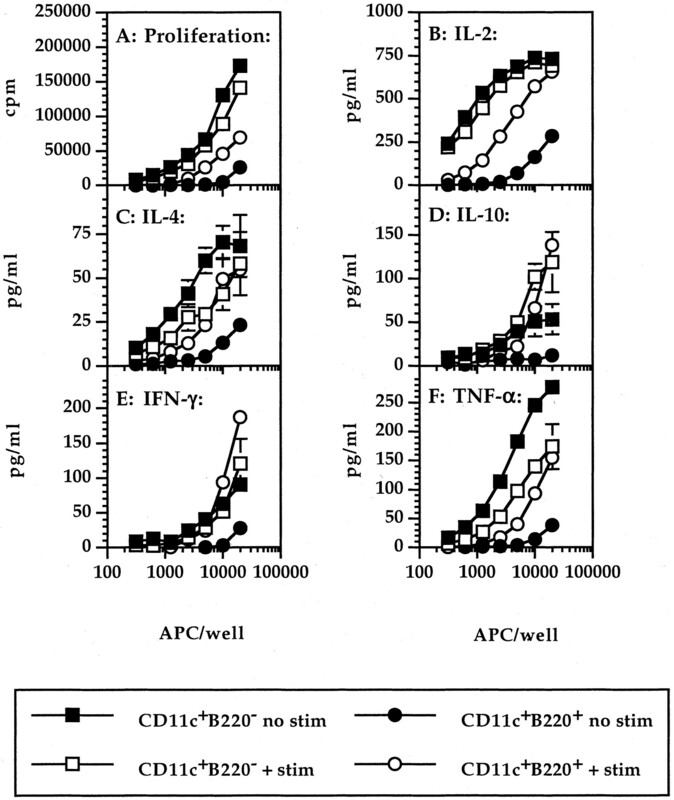 IL-10 was produced when activated CD11c+B220− or CD11c+B220+ DCs were used as APCs for naive CD4+ T cell priming. Intracellular detection by flow cytometry of this cytokine confirmed its production by activated CD4+ T cells (data not shown). Fig. 7⇓ shows the priming capacity of BM-derived DCs for naive CD8+ T cells. OT-I CD8+ T cells cultured with unstimulated CD11c+B220+ DCs previously incubated with OVA protein were poorly activated and proliferated weakly. In addition, these T cells inefficiently killed syngeneic (H-2b) peptide-pulsed C1498 target cells in a cytotoxic assay, and IFN-γ secretion remained under detectable levels (Fig. 7⇓, middle and lower panels). However, stimulation of CD11c+B220+ DCs with CpG plus CD40L plus GM-CSF was efficient for the induction of cell proliferation, specific cytoxicity, and IFN-γ secretion, to levels comparable to those observed when CD11c+B220− cells were used as APCs. CD8+ T cell stimulatory capacity of BM-derived CD11c+B220+ DCs. Sorted CD11c+B220− (▪, □) and CD11c+B220+ (•, ○) DCs from C57BL/6 mice were pulsed in vitro for 24 h with 0.5 mg/ml OVA (OVA-protein) and simultaneously activated (□, ○) or not (▪, •) with 2 μg/ml CpG, 5 μg/ml CD40L, and 20 ng/ml recombinant murine GM-CSF. DCs were then used as stimulator cells for syngeneic OVA-specific TCR-Tg (OT-I) CD8+ T cells. Proliferation (A), cytotoxicity against syngeneic (H-2b) C1498 targets cells (B), and IFN-γ secretion (C) were quantified by [3H]thymidine incorporation, 51Cr release, and ELISA, respectively. Results are presented as the mean ± SD of triplicate wells, and the experiment was performed three times. The current study extends previous findings from our laboratory in the description of a FL-dependent culture system allowing the generation of different BM-derived DC subsets (22) by further defining an additional subset (CD11c+B220+) showing phenotypic and functional characteristics similar to those of the recently identified murine pDCs (17, 18, 19, 20, 21). In this study, we report that BM-derived pDCs had an immature phenotype, showed a nonoverlapping TLR pattern of expression compared with that of classical CD11c+B220− DCs, and were poor T cell stimulators. Stimulation of CD11c+B220+ cells led to a switch in chemokine receptor expression that affected their migration, to IFN-α and IL-12 secretion, and to the acquisition of CD4+ and CD8+ T cell-priming capacities. Finally, we also report that pDC generation was regulated in vivo by FL, because FL-KO mice showed a major reduction in splenic pDC numbers. FL played a crucial role in the generation of CD11c+B220+ pDCs from BM progenitors. This confirms recent data, reported during the writing of this article, in a related culture system (23), as well as data showing the in vitro generation in FL-containing medium of human pDCs from CD34+ human fetal tissues and cord blood progenitors (33). By contrast, GM-CSF, which was efficient in generating “classical” DCs in vitro, had a strong negative effect on pDC generation. GM-CSF could even antagonize the effect of FL, because no CD11c+B220+ DCs were generated when both cytokines were mixed in the same culture medium. Although this shows that FL, as the sole exogenous factor, is sufficient to drive DC generation, we cannot exclude the contribution of other endogenous factors in conjunction with FL in this system. We also compared the absolute numbers of CD11c+B220+ cells in FL-KO and wild-type mice (see Fig. 2⇑). FL-KO mice had reduced total DC numbers (24) including pDCs compared with wild-type counterparts, showing for the first time the major role played by this growth factor in vivo for constitutive pDC generation and/or expansion. In vivo administration of FL strongly increased the total number of murine splenic pDCs (P. Brawand and T. De Smedt, data not shown; Ref. 19), in accordance with results obtained in the human system (34, 35). Thus, we conclude that pDC generation, differentiation, and/or survival are regulated by FL in vivo. The in vitro generation of multiple DC subsets in the same culture from BM precursors raises the question of whether these subtypes are independent DC lineages or whether they do represent different stages of development of the same lineage. Over the past several years, splenic DCs in the mouse have been classified as “lymphoid” and “myeloid” based upon the expression of CD8α (CD8α+ and CD8α−, respectively) (for review, see Ref. 36). This concept has been challenged by two recent reports demonstrating that both subsets can be generated from a single lymphoid- or myeloid-committed precursor population, supporting the concept that they do not represent separate DC lineages (37, 38). In addition, highly purified splenic CD8α− DCs, injected i.v. and traced in vivo acquired the phenotypic characteristics of CD8α+ DCs (39). In this study, we report that stimulation of BM-derived CD11c+B220+ DCs with CpG plus CD40L plus GM-CSF induced CD8α up-regulation but not that of DEC-205, another marker for CD8α+ splenic DCs, as opposed to CD11c+B220− cells. CD8α up-regulation was also reported for ex vivo murine pDCs after in vitro activation (20). A possible explanation could be that, like “classical” DCs (40), pDCs do not express CD8α constitutively, but acquire the phenotypic characteristics of CD8α+ DCs during differentiation and/or under specific environmental conditions. Although CD8α expression does not seem to play a role in “classical” CD8α+ DCs function (41), it remains to be addressed whether the acquisition of CD8α expression is important for pDC function. Despite the questions concerning a possible common origin between “classical” DCs and pDCs, BM-derived CD11c+B220− and CD11c+B220+ cells exhibited different patterns of TLR expression. We found that CD11c+B220− BM-derived DCs preferentially expressed TLR2, TLR3, and TLR4, confirming results reported for human myeloid DCs (Refs. 11, 42 , and 43 and reviewed in Ref. 12). In contrast, the expression of these three TLRs was lower in BM-derived (Fig. 4⇑A) and in freshly isolated splenic (data not shown) CD11c+B220+ pDCs. TLR4 was reported to be expressed by LPS-responding DCs (44) and its low expression in BM-derived pDCs might explain why these cells were insensitive to LPS in our stimulation experiments (Fig. 4⇑A). Like human pDCs (reviewed in Ref. 12), murine BM-derived (Fig. 4⇑A) as well as freshly isolated (data not shown) CD11c+B220+ pDCs expressed high levels of TLR7 and TLR9, which were recently shown to be involved in the recognition of some viral compounds and CpG motifs found in bacterial DNA, respectively (45, 46). This could explain why BM-derived CD11c+B220+ pDCs, like ex vivo CD11c+B220+ DCs (19, 20), were efficiently activated by viruses and CpG motifs. TLR7 and/or TLR9 triggering and signaling might be an important pathway inducing pDCs to secrete high amounts of IFN-α that would fight viral or bacterial infections (reviewed in Ref. 47). In addition, IFN-α secretion might also stimulate DCs in an autocrine manner to induce their maturation (48). HSV-1 and CpG alone induced low levels of IL-12p70 by both CD11c+B220− and CD11c+B220+ DCs as recently reported by Gilliet et al. (23). However, the combination of CpG plus CD40L plus GM-CSF induced the secretion of high levels of IL-12p70 by CD11c+B220− DCs whereas IL-12p70 production remained low for CD11c+B220+ pDCs (Fig. 4⇑A). The same observation was made when freshly isolated splenic CD11c+B220− and CD11c+B220+ DCs were stimulated under identical conditions (data not shown). This is in accordance with results obtained by Schulz et al. (49) who showed that optimal production of bioactive IL-12 by classical DCs is initiated by innate signals but is amplified by T cell-derived signals. DCs are characterized by the ability to migrate and to prime naive T cells (reviewed in Refs. 1 and 2). During maturation, DCs lose the ability to capture Ag but gain the capacity to present Ag. Human circulating pDCs express L-selectin (CD62L) and are thought to enter inflamed LNs directly from the blood upon stimulation, via high endothelial venules (9). Interestingly, L-selectin-deficient (Sell−/−) mice were shown to have a marked paucity of pDCs in the LN (21). In addition to CD62L-mediated migration, chemokines might play important roles in mobilizing pDCs, either at the site of infection or in the LN to activate T cells. Thus, we analyzed the migratory capacities of BM-derived DCs using an in vitro chemotaxis assay and also looked at the mRNA level of two key chemokine receptors whose expression is regulated during maturation. CD11c+B220+ DCs, in an immature state, were strongly mobilized by inflammatory chemokines such as CCL3, CCL4, and CCL5, supporting the argument that immature pDCs can migrate into sites of inflammation. In this study, we also describe that CD11c+B220+ DCs in culture for 24 additional hours in the absence of stimulation remained more immature in terms of chemokine responsiveness than CD11c+B220− DCs. This difference between the two subsets could be due to a higher activation threshold that would not allow CD11c+B220+ DC responses under these conditions. These cells maintained the capacity to migrate toward CCL3, CCL4, and CCL5, whereas CD11c+B220− DCs lost CCL3-mediated, but gained CCR7-mediated, mobilization. However, after maturation with CpG plus CD40L plus GM-CSF, both subsets became responsive to CCL19 and CCL21, both ligands of CCR7, a chemokine receptor preferentially expressed by mature DCs (30, 32). In the absence of activation, blood pDCs might preferentially migrate toward sites of infection or inflammation, where inflammatory chemokines are found in higher concentration. Of note, two recent reports described the accumulation of human pDCs in peripheral sites such as the skin in cutaneous lupus erythematosus lesions (50) and the nasal mucosa in airway allergy (51). However, upon activation, pDCs might shut down CCR5 responsiveness and be attracted to the LN by CCR7 ligands. Our in vitro T cell-priming data revealed that pDCs were poor stimulators of both CD4+ and CD8+ TCR-Tg T cells (Figs. 6⇑ and 7⇑) and had to be strongly activated to induce proliferation, cytotoxicity, and Th1 and Th2 cytokine secretion by naive T cells. It has been proposed that, in the absence of maturation, DCs can induce tolerance (52) or the differentiation of naive self-reactive T cells toward IL-10-producing, CD4+ (53, 54), or CD8+ (55) T cells with regulatory properties. Human pDCs, when cultured in presence of IL-3 and CD40L, also induce regulation through the generation of IL-10-producing CD8+ T suppressor cells (8). Thus, it would be of interest to determine whether unstimulated murine pDCs play a role in this phenomenon, as reported recently by Martin et al. (56), and therefore serve as targets in therapeutic settings. Finally, stimulation levels of naive CD8+ T cells by activated CD11c+B220− or CD11c+B220+ DCs were similar for proliferation, cytotoxicity, and IFN-γ secretion (Fig. 7⇑). However, naive CD4+ T cells were always stimulated in a more efficient way by activated CD11c+B220− DCs than by CD11c+B220+ pDCs (Fig. 6⇑). IFN-α secretion by pDCs might be responsible for this difference. Indeed, IFN-α was shown to play a major role in the proliferation and survival of CD8+ T cells (13, 14, 15) and might thus bring CD8+ T cell stimulation to levels similar to those induced by “classical” DCs. Blocking IFN-α signaling pathway by adjunction of an anti-IFN-α mAb or by using type I IFNR (IFNAR)-deficient mice (57) might help to solve this issue. In this report, we have described an in vitro culture system allowing the generation from BM progenitors of immature murine CD11c+B220+ pDCs and compared these cells phenotypically and functionally to classical CD11c+B220− DCs. This system might thus be useful for the generation of high cell numbers of multiple DC subsets including pDCs that would allow us to understand their biology in vivo. We thank Julie Hill, Steve Braddy, and Daniel Hirschstein for flow cytometry expertise; Wilson A. Chin, Laurent Galibert, and Mike Comeau for technical help, discussion, and critical reading of the manuscript; and Gary W. Carlton for graphics assistance. ↵2 Abbreviations used in this paper: DC, dendritic cell; CpG, oligodeoxynucleotides containing certain CpG motifs; FL, Flt3 ligand; FL-KO, FL-deficient; BM, bone marrow; LN, lymph node; pDC, plasmacytoid pre-DC; TLR, Toll-like receptor; CD40L, CD40 ligand; SAC, Staphylococcus aureus Cowan I bacteria; MIP, macrophage-inflammatory protein; CCL, CC chemokine ligand; Tg, transgenic.